I started off with an oil treatment as my pre-poo. I used Jamaican Black Castor mixed with peppermint oil on the scalp. In section I massaged the oil on the scalp. I made sure that I gave my problems are some extra love. – I will write an article about my problems areas and how I take care of it- . 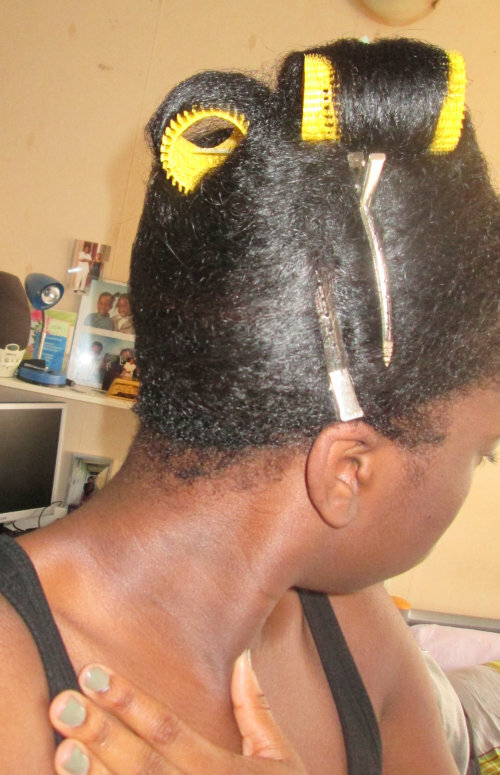 when I was done with my scalp, it was time to apply my pre-poo oil mix (Coconut Oil x Olive Oil) on the hair. I covered my hair with a plastic bag and on top of that I placed a scarf for some heat. I pre-poo for about 2 hours, I didn’t mean to. I was Cinderella for the day, so I had to cook diner for the family. I shampooed my hair with Mizani Botanifying Conditioning Shampoo. This is the 3rd time using it and I like. After the first wash my hair felt a bit stiff, but as you know I always wash my hair twice. After the second wash my hair felt good, no more stiffness !! When I do a protein treatment the first product that comes to mind is ORS Hair Mayonnaise. I have been using this product for a long time. In sections I applied the conditioner. I didn’t add any oils to it. I like the way how my hair soaks up the product. I covered my hair with a plastic bag. To create some heat I place a towel wrap on my head. After the first treatment I could really feel that my hair needed some moisture. It was late and I was tired so I applied Creme of Nature Professional Moisture Extreme Conditioner on my hair. This time there were no sections. I wanted to be done with it. I used my hooded dryer to speed up the process. 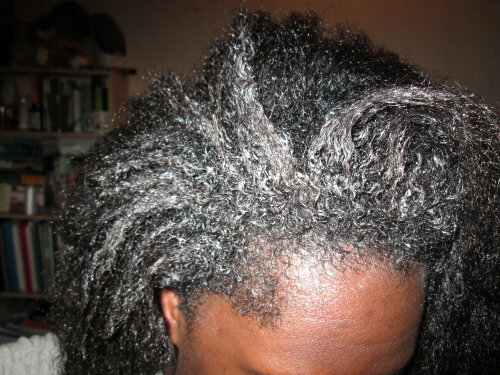 Men men men .. after I washed my hair .. ughhh it was dry as f***k. The conditoner didn’t give me the boost that I needed. It is 22:58 PM and I’m fighting with myself. My plan was to do a roller set, but I changed my mind because of time. I applied Creme of Nature Argan Oil Strength & Shine in x ORS Wrap/Set Mousse x Fantasia IC Hair Polisher Heat Protector Straightening Serum on my hair. I wrapped my had and placed a few rollerset in my crown area. I needed to remind myself that I’m 25 weeks post. Wrapping my hair was hard!!. I sat under my hooded dryer for about an hour. My hair wasn’t done , but I was time for bed. Ow my days .. my hair was so dry. One thing I can say the protein treatment worked. I was getting ready for church so I had to fix the dryness ASAP. 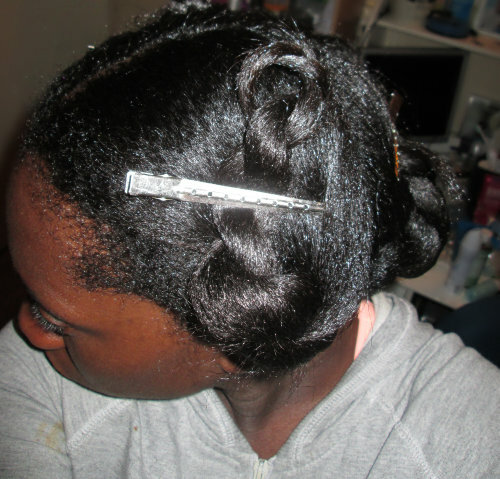 I decided to moisturize my hair with Elasta QP … and seal with grapseseed oil for some shine. 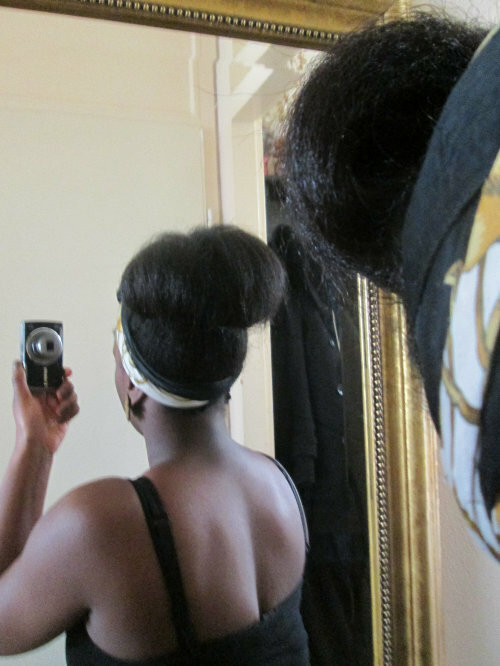 Styled my hair in a high bun and I was good to go. That protein treatment showed me who the boss is ! !